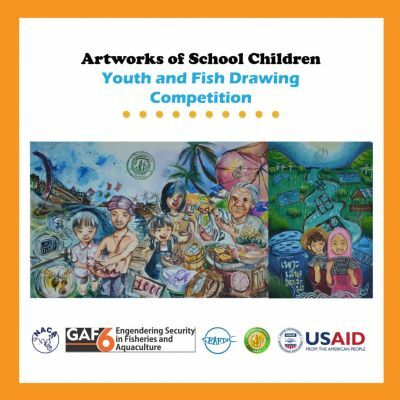 This Souvenir Book reproduces the winning entries from the Youth and Fish Drawing Competition for Thai junior and senior high school students that was held during the 6th Global Symposium on Gender in Aquaculture and Fisheries (GAF6) in Bangkok, 4-7 August 2016. The competition was organised by the Faculty of Fisheries - Kasetsart University, the Network of Aquaculture Centres in Asia-Pacific and the USAID Oceans and Fisheries Partnership. This was the first activity involving youth in raising awareness of the gender dimension to be conducted at a GAF event. The Youth and Fish Session was born out of the need to help raise awareness, through art in schools, of gender in aquaculture and fisheries. In her introductory speech to the event, Dr Arlene Nietes Satapornvanit, Gender Specialist at the USAID Oceans and Fisheries Partnership, said “we believe that we should start our advocacy about gender awareness and sensitivity at a young age, so that these concepts will be ingrained in the mind-set of the youth, and they will keep and carry it on until adulthood. That being gender sensitive is not only a one-time activity but a lifestyle. The youth are the future leaders and if we have leaders who are gender sensitive, we can be assured that there is inclusivity in their actions, and that no one will be left behind.” The Youth and Fish Session was considered a pilot activity and it is hoped that this could be expanded to other countries in the region in the future. Ten senior and seven junior high schools participated, with two students (male and female) from each school. They were accompanied to the venue by their parents and teachers. The competition ended after nearly three hours of drawing and painting. The organisers would like to acknowledge the panel of judges for their time in looking at all the entries. The students produced beautiful and meaningful art and the judges faced a challenge in choosing the winners. Congratulations to all the students, schools, teachers and parents for their participation and support. The event was supported financially by the Network of Aquaculture Centres in Asia-Pacific.